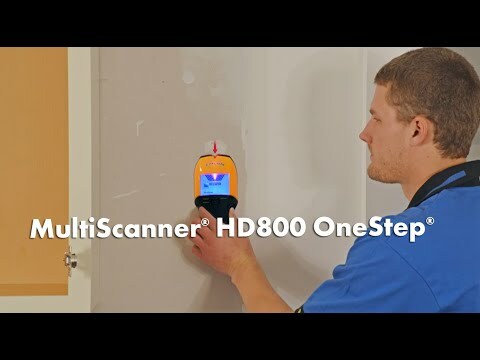 MultiScanner® HD800 OneStep® multifunction stud finder locates the center and edges of wood and metal studs and joists behind walls, floors, and ceilings. It also locates metal targets up to 3 in. (76 mm) deep. A 3-mode switch makes it easy to change functions, while the backlit display screen, SpotLite® Pointer, and audio tone all indicate the location of the target. The signal strength indicator helps to distinguish between shallow and deep targets. WireWarning® detection indicates the presence of live, unshielded AC electrical wiring up to 2 in….